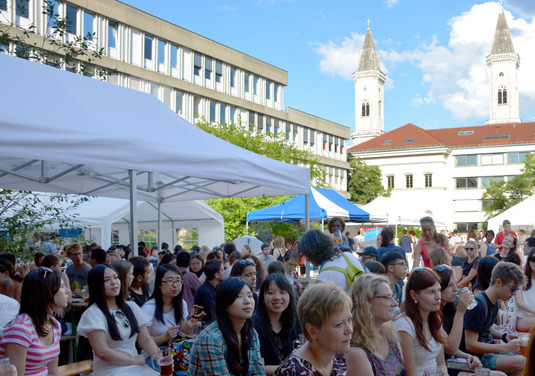 On Monday last LMU welcomed the 800 participants attending this year’s Munich International Summer University (MISU) with a generous measure of Bavarian Gemütlichkeit. So the students from around the world had their first opportunity to become acquainted with each other – and with Leberkäs, Blasmusik, Brezen and beer. At precisely 5 o‘clock on this summer evening, the students who have signed up for this year’s MISU courses begin to file onto the roof of the Dining Hall on Schellingstrasse. Christa Wenhart-Ritter of LMU’s International Office is the Coordinator of the Munich International Summer University, and she suspects that her charges have all been imbued with the notion that Germans are always on time. “That’s probably why no one wanted to risk being late for the reception,” she says. Stefan Lauterbach, Head of the International Office, is on hand to welcome the students from 80 countries who have enrolled in Summer Academies and language courses this year. Kübra Yüzüncüıl from the University of Ankara is one of them. She is attending the academy on “Politics, Economics and Societies of the Middle East”, a course which is a new entry in the MISU program. Kübra herself, however, has already delved into the subject: “I have done a study of the cultural impact of the Arab Spring,” she says. 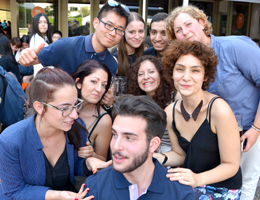 “My supervisor in Ankara recommended the Summer University in Munich to me – and the topics we will be dealing with are really very interesting.” Local students like Lena Nassrallah are also among those taking the course. Lena, a student at LMU’s Institute of Near and Middle Eastern Studies, sees the summer academy as an ideal opportunity to learn more about the political landscape of the region. “My study course at LMU focuses on the languages and cultures of the Middle East, and that unfortunately leaves little room for contemporary political issues. The vacation course helps to make up for that,” she says. In seminars, lectures and workshops, the Summer Academies will tackle topics in 14 subject areas, including new media and entrepreneurship, as well as the aforementioned course on Middle Eastern politics. But as Anni Fan pointed out, the MISU also provides for distractions from the academic curriculum. Participants can also enjoy a wide range of cultural activities, including trips to attractive destinations such as Neuschwanstein, the Allianz Arena in Munich and nearby Salzburg.